Google Personalized Search Engine Optimization (SEO) ? 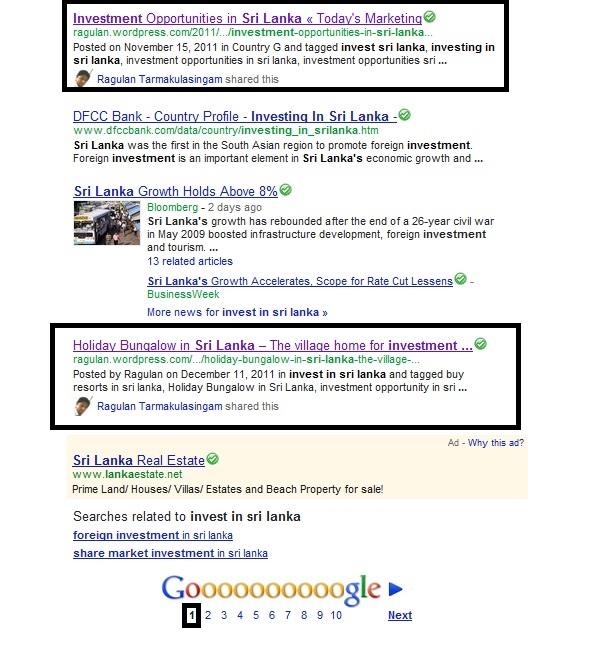 Its interesting to see that Google always changes the way it operates. Time to time search engine results vary and recently I observed another change (possibly I might be late). I’m also not sure how to name it, but seems like “Personalized SEO”. I would say this would bring more and more benefits to the firm if handled and used carefully. My blog is always ranked high in Google Search Engine for important keywords, drives me several visitors per day. Whenever I update my blog the post quickly get scrolled and showed in the top position in the Google ranking. For some keywords I wondered how it got ranked up. Later I identified Google has linked the Gmail and SEO together. If the person in your Gmail contact searches for a keyword which is relating to your post / site then the respective post / site comes up in the ranking. Lets try an example and see. Step one – I logged in to my Gmail from other account, which has already my main Gmail contacts saved. Then I logged out from Gmail and again searched for the relevant keyword, where I couldn’t see the same results. So I’m not sure about my guess on these, however I can see that Google tempting people to use Gmail more and giving more personalized search results. 3- At the same time they should share their online presence such as website, blogs etc etc. Both should be killer content. 4- Now when they search for relevant keywords since the firms are in the contact list with shared content the relevant content will appear in the first page, which might surprise them and create credibility. (But using Gmail for customer contact may not represent professionalism since people may worry about the trust). Go to your Settings/Filters page and create a new filter. In the Has the words field enter “is:unread” (without quotes), and click the Next Step button. You’ll get a message warning you that this type of filter won’t be applied to new mail, but that’s OK. Click OK to continue. Check the boxes next to Mark as read and Also apply filter to … conversations below. Click Create Filter button, and you’re done. You might want to should delete the filter once you finish since it won’t be needing it anymore.